Ultimate Styles of America Inc. specializes in top-quality custom cabinetry, decorative millwork and built-in furnishings for residential and commercial properties on Long Island and in the New York City metropolitan area. We are locally owned and operated by a master craftsman. At Ultimate Styles, our friendly, talented staff is ready to help you from project design to installation. We pride ourselves on developing unique spaces with exceptional pieces made of the finest materials to fit your specific needs. We combine superior craftsmanship with outstanding customer service. At Ultimate Styles, we offer complete design, manufacturing, finishing and installation services. We'll work to specifications from your architect or interior designer or we'll work directly with you to design your residential or commercial project. We specialize in space planning, and we'll design a project that makes best use of the size of your site to maximize efficiency and floor space. We'll consider how your project will be used—whether functional (like a wall unit or kitchen cabinets) or decorative (like crown molding)—and recommend appropriate height, sizes and angles. We want your project to be beautiful, so we'll suggest rich, attractive hardwoods and striking finishes that coordinate with your floors, walls and other furnishings. We work in all styles, from country to traditional to contemporary. Using computer-aided design software, we'll generate high-quality renderings of your project before the first board is cut to ensure you get exactly the design you desire. Our expert cabinetmakers will fashion rich, high-quality timbers of maple, mahogany, cherry, or the wood of your choice into doors, drawers, shelves or panels for your project. High-precision, state-of-the-art CNC machinery is used to achieve accuracy and ensure proper fit of all components. Some intricate detail can only be achieved with fine tools in the hands of our skilled craftsmen. Every single piece is constructed with care and close attention to detail. 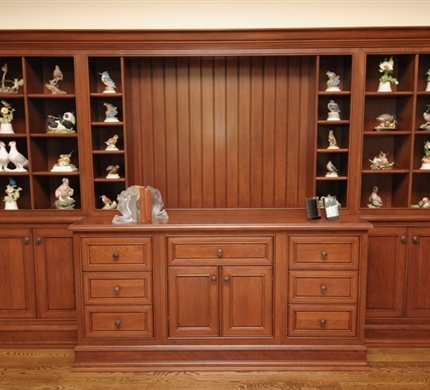 Such high-quality fabrication deserves hand-finishing, which is done by our expert woodworking team. Each cabinet, panel or accessory is carefully wrapped and delivered to your home or office for assembly and installation. We install piece by piece to ensure a custom fit. Moldings are scribed on-site to ensure perfect corners and a snug, natural finish.